"I haven't seen our staff so excited about a program or a trainer in years." Give your teachers the very best: an expert, in-person training on AppleWorks, Microsoft Office, Handheld Computers, or Digital Camera Use from Janet Caughlin, nationally known K-12 and college teacher trainer, and author of nine top-rated resource books on AppleWorks, Office, Handheld Computers and Digital Cameras. See why schools book Janet again and again to help their teachers get the most out of these amazing and important classroom products. What Types of Trainings Are Available? Four Hour Overview: Please call for pricing. One Day (6 hours) Overview: Please call for pricing. Two Day (12 Hours): Please call for pricing. Author of AppleWorkshop for Teachers, ClarisWorkshop for The Home, AppleWorkshop for Students: Elementary K-6 -The Curious Years, AppleWorkshop for Students: Secondary 7-12 -The Sophisticated Years, PowerPoint Workshop for Teachers, Word Workshop for Teachers, Excel Workshop for Teachers, Access Workshop for Teachers, TimeLiner Workshop for Teachers, Handhelds for Teachers & Administrators, and Digital Photography for Teachers. Want to know more about Janet? Click here. "Janet has conducted face-to-face workshop for our area teachers for two years, and recently has done Distance Learning workshops over the Iowa Communications Network. Our feedback is very positive. She'll do more interactive training sessions next year. As a former teacher, she has an excellent understanding of utilizing technology in the classroom." "Our staff attended a Janet Caughlin training session on Microsoft Word. They came away excited about the program, its capabilities, and the ways they could use Word in their classrooms. They announced that they would like to attend more training sessions with Janet. I haven't seen our staff so excited about a program or a trainer in years. Janet made the session fun while dynamically presenting Word to our teachers." 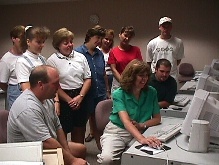 "Janets workshops are an excellent way to get a broad overview of AppleWorks or PowerPoint. She has a smooth style of teaching which makes learning fun and creates a comfortable classroom environment with projects flexible to many areas. I absolutely loved it!" "Janet tailors her workshops to fit technology into all levels and areas of education. Shes bright, energetic, and extremely patient. Dont miss an opportunity to attend one of Janets workshops! I guarantee you wont regret it!" "This was a great class! Janet taught me many shortcuts and time savers. The skills I gained have made my classroom record keeping so much easier and efficient." "Janet is exciting and well organized. Staff members leave wanting to know when shell be rescheduled so they and their colleagues can learn more!" "Janet is one outstanding instructor. Her graduate classes are among the first to fill and receive excellent evaluations every semester!" To check Janet's training schedule, please visit "Where's Janet?"